I’ve been intrigued by this recipe forever – well, since first seeing the recipe in the book and then watching it being made by Dani at a Cooking Class a couple of years ago. It’s amazing to watch being made – think witches cauldron with smoke everywhere and a brilliant emerald green sorbet. Stunning, both visually and taste wise. The dry ice component of this recipe was always going to be the bugbear for me. It’s not that hard to source, but the fact that you have to buy it, store it and use it within 24 hours was a little too organised for me. This recipe comes from Pierre Roelofs (see his website at http://www.pierreroelofs.com) He’s the man behind the weekly Desert Evenings at Cafe Rosamond in Fitzroy. I’ve just read about them – and I want to go! Pierre has worked or studied at an impressive array of restaurants all over the world – including doing an internship with my food crush Heston Blumenthal at The Fat Duck. I adore the way he thinks about food. And guess what – I’m going to The Fat Duck in less than a month! I’m sure Heston won’t be there, but I am so excited about tasting the dishes I have heard so much about for so many years. Dani mentions in the book that you need to collect and use your dry ice on the same day. Unfortunately the good folk at BOC Preston (where I got my supply) aren’t open on Sunday and in fact close at midday on Saturday. That wasn’t going to work for me as we have our family dinners on Sunday night. So, I took a gamble and rolled up at about 11.30 Saturday morning with my little polystyrene box under my arm. If you are planning on making this, then make sure you have an adequately sized container for your dry ice. I used the polystyrene box that the Bambino Cone ice creams come in – and it was ideal. The recipe only calls for a few hundred grams of the dry ice, but with the time factor between buying the ice and using it, I erred on the side of caution and bought 2 kilos of the pellets. The container held 2 kilos really well. More than 24 hours later I still had more than enough for the recipe, even after a reasonably warm Melbourne day. Rather stoically, I resisted temptation and didn’t even open the box once to take a peek, and then I put the box in another esky and left it in the laundry. I was given an information sheet when I bought the dry ice, which tells you that in ideal conditions a 5 kilo block of dry ice will last 48 hours. My advice would be to speak to the experts at the shop and tll them how long it will be before you’re going to use the ice, and they should be able to tell you how much to buy. Although it seems a little counter intuitive, you don’t store it in the fridge or freezer, just in the esky you have it in. What the pamphlet doesn’t say, but on the advice of one of my neighbours who deals with dry ice regularly, was that some people can feel a little light headed around dry ice – it’s something to do with the concentrated carbon dioxide. So take car while it’s in your car, or near you. Thankfully, my mint has been rather prolific this year, and I thought I’d have oodles left over, but after about 7 trips out to the herb garden, I finally had the requisite 140 grams of mint leaves, and boy – that’s a lot of mint!! Just look at the size of the bag that is holding them! 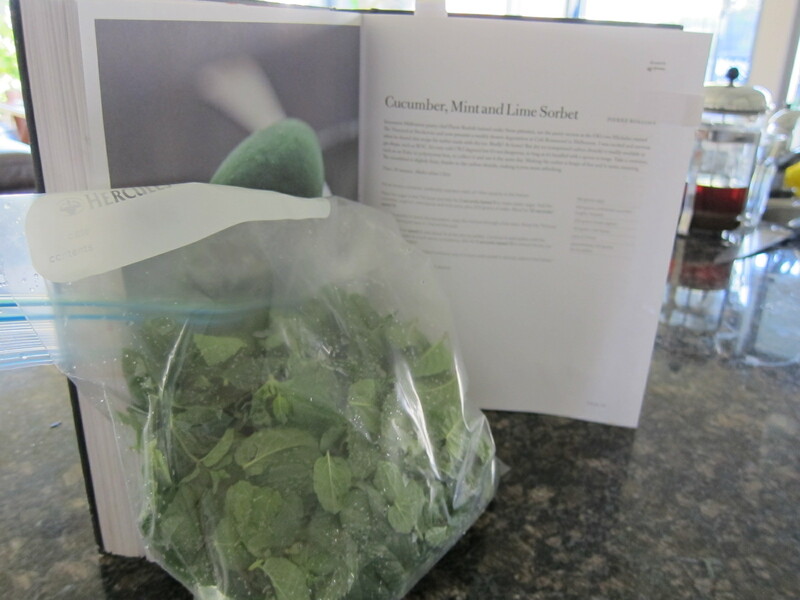 Luckily, I did the mint leaf part on Saturday afternoon and stored them in a zip lock bag in the fridge. If you were buying mint from the greengrocers, my bet is that you’d need at least 5 or 6 bunches of it to get the 140g of leaves. I was pretty fussy and used only leaves, I’m not sure if this impacts on the flavour or not, but it wouldn’t impact on the consistency of the sorbet as you strain it and discard the pul, so you could possibly try adding some stem for the weight. If you are preparing it in front of guests, then have the mint leaves picked and ready as it takes a long time to pluck them all. Making the sorbet is really easy. First you grind down your sugar, the add the cucumber, mint leaves, yoghurt, lime juice and water. If I had my time again, I would probably add the mint leaves with the sugar and blitz them together as the mint takes up a serious amount of space in the bowl. I managed to get everything in the thermo bowl – just – but I had put the cucumber in first, and if you put the mint leaves in first and the cucumber on top the you might get away with it. You don’t have to peel the cucumber at all – just roughly chop it into chunks. Once that’s blitzed you need to strain it quickly. I was able to strain mine straight into my indulgent second bowl, but otherwise you’d need to rinse it first. I used a spatula to stir the liquid through the sieve and it took about ten minutes. If you take too long, apparently the liquid can discolour. I wish my sieve was a little finer, but the one I used did the job – just not as thoroughly as I would have liked. You end up with lots of green that you discard, but the upside is that it smells lovely! So…the moment of truth came. The time to add the dry ice and to watch the magic happen! Whooooo! It reminded me somewhat of Heston’s Ejaculating Pudding from his Roman Feast show 😉 It made a hell of a mess, but it was worth it! My trusty photographer snapped away while I spent about a minute precariously balanced between thrill and mortification. If you’re doing it the way the recipe says, my recommendation is to get a chilled bowl and weigh your dry ice into that, so you know roughly what quantities you are dealing with. Make sure you use a spoon, ladle or tongs to sccop it into the bowl or you will burning the living daylights out of your hand. I found it easier to use a ladle with the pellets (they were roughly the size of the old one cent piece) as the tongs were a little too tricky. 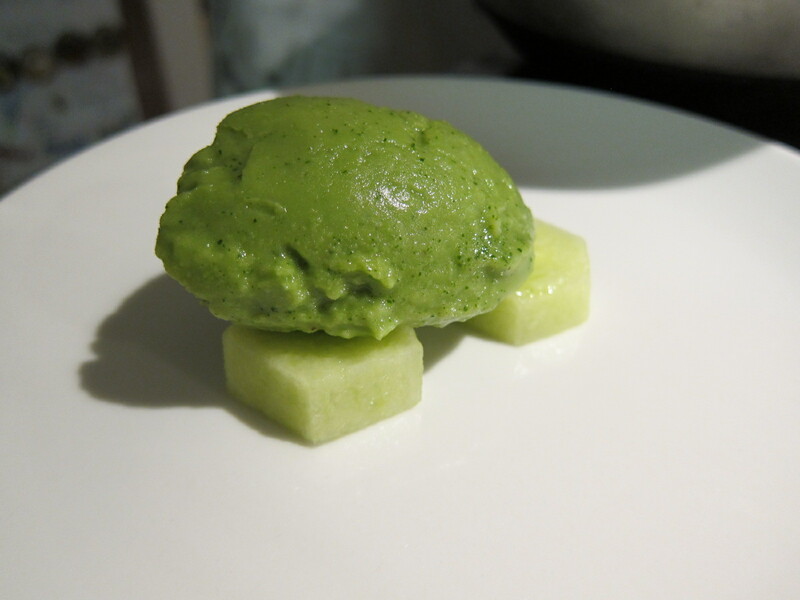 So, in less than a minute, while my kitchen resembled something from Macbeth, the green juice and the dry ice combined to create the most magnificent sorbet. Dani says you can freeze it up to an hour, which is what I did. I certainly wouldn’t leave it any longer than that, even though I put mine in a freezing cold bowl, covered it and put it back in the freezer. Because the freezer is warmer than the dry ice, it went a little mushy for mine. Next time I’ll try the 350g of dy ice all at once, and will make it when I want to serve it. I’ll do it in front of our guests so they can enjoy the theatre of creation, and issue them with aprons just in case it overflows again! The resulting sorbet is just divine. The lime really cuts through the mint, and if you eat one of the little cucumber discs that you serve it on, you really enhance the flavour of the cucumber as well. It’s deliciously smooth – I think from freezing so quickly – and sightly effervescent in your mouth. Even Master 5 was incredibly impressed – and it’s green! So, in short – it’s definitely worth tracking down a dry ice supplier, and searching our an insulated container that is just the right size for your stash. For the record, the box I used was 30cm wide, 20cm long and about 9cm deep. The BOC man said it would fit about 2 kilos of dry ice. The dry ice was about $10 a kilo. Stumbled on your blog while checking out reviews for In The Mix… I think you’ve convinced me that this cookbook is worth buying! Thanks for sharing! Most definitely! 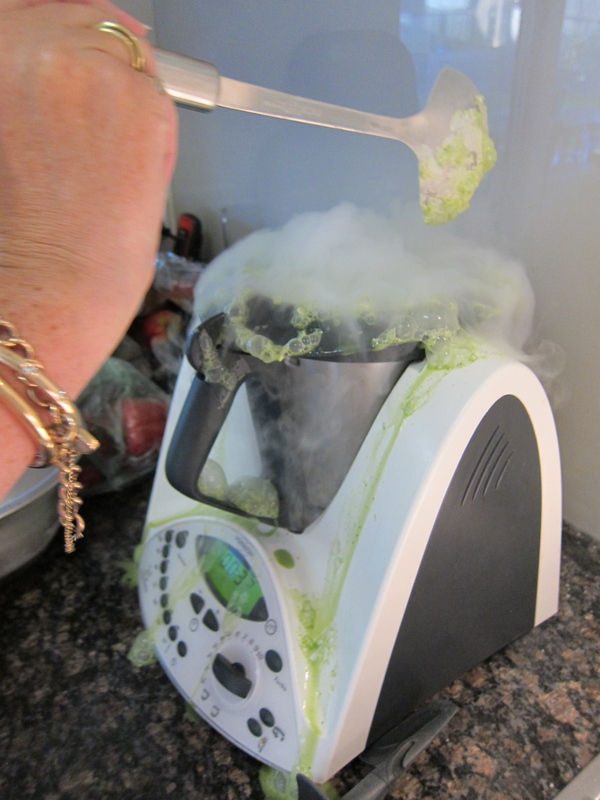 It is my absolute go to thermomix book. Hope you enjoy it!